Like every Mom in town, you know I had to do my time in the candy aisle this week. Why? Because you are never too big for an Easter treat at my house. Granted, I have slacked off a bit as the kids got older. To cover myself, I've made up rules about Easter baskets that I state with an air of authority to catch them off guard (this usually works!). I've refrained from actually saying something misleading, like "didn't you know that?" For starters, I've made the first rule which states that to actually get your candy in a basket (oh, heck, let's just say container, in case I decide to re-use gift bags) you must still live at home OR be a grandchild. That doesn't leave the older guys out in the cold, they will still get a chocolate bunny, at minimum, although I'm thinking Magoo would prefer his bunny to be made of ham. For some reason, I can't keep track of who likes jelly beans versus malted eggs. Rule number two is "you have to work for the little stuff." With the finesse of a stressed out Vegas dice player, I mix them all together and fling them in the basket (mama needs a new pair of shoes!). Remaining candy will get put in candy dishes for some high calorie sugar archaeology. A mini-challenge for the holiday! Dig till you find what you like! There should be a third rule, though I don't need this one at my house. It came to me as I risked life and limb as I braved the crowded Easter aisles and watched an overwhelmed young Mom make Easter threats ("The Easter bunny doesn't like when you fight with your brother!"). She shook a giant chocolate bunny-behemoth for emphasis. I wondered what message the kids derived from the exchange. If I weren't Christian, I wouldn't celebrate Easter at all - not to honor an imaginary bunny, for sure. And if I ever threatened my children with the wrath of the Easter Bunny, I'm certain that Juggernaut would have have gone into full imaginary ninja mode and given me a complete game plan for the bunny's defeat. He's like that. Thankfully, that's not how we look at Easter. I do celebrate Easter; it's a biggie with Christians - the biggest of the biggies. I'm willing to go out on a limb and say it is more important than Christmas. We celebrate the whole holy week, and it has nothing to do with candy. The day of Easter starts with church in the morning; it's a day of worship and thanks. My children understand the story behind Easter and the reason behind the celebration. We don't do it to please the Easter bunny. Candy is part of the celebration, but everyone in our house knows it's not the reason for Easter. And so, my third rule would be that if you are going to celebrate - do it right: it's not about the bunny. If you think it's just about the bunny, don't bother. You can get candy any day of the week, but if you don't know why we celebrate Easter, then you're just a hyperglycemic chocoholic on a Spring Sunday. Special blog offer: I'd love to tell you the Easter story any day of the week. 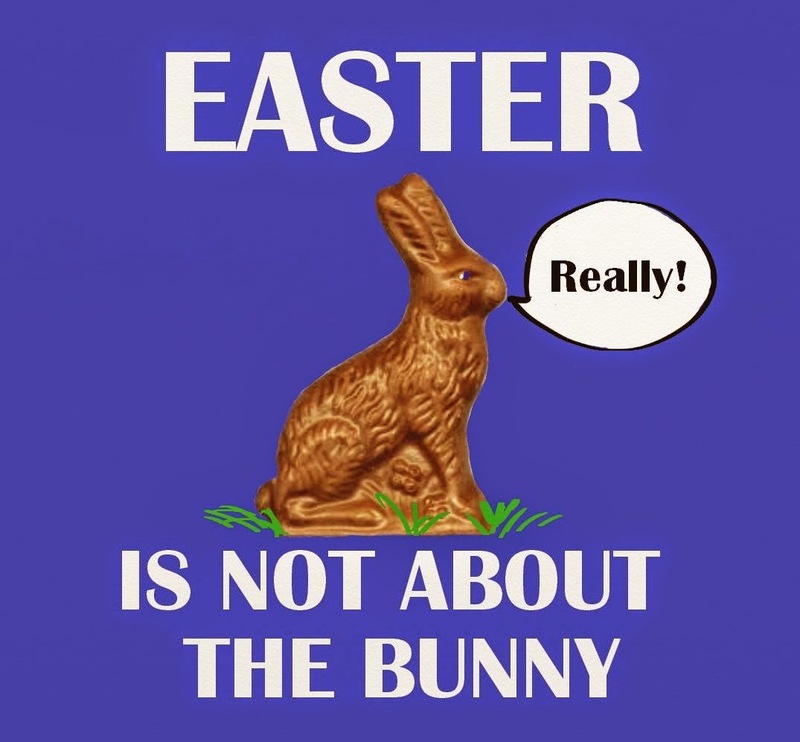 Spoiler alert, one more time: It's not about the bunny.